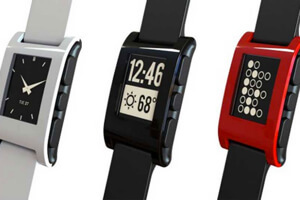 Since the Pebble Kickstarter dropped last spring, smartwatch rumors and releases have abounded. Even as Samsung released its Galaxy Gear, Apple was rumored to be working on their own smartwatch model. It always seems to be the year of something in tech—and some wondered whether 2013 would be the year of the smartwatch. Of course, some here may remember the smartwatch’s birth a long time ago in a galaxy far, far away. In the 70s and 80s, there was an impressive collection of “nerd watches” boasting calculators, thermometers, video games, calendars, even basic note taking. Ultimately, clunky calculator watches didn’t become a staple, but digital watches have remained popular in niche markets like athletics, where they measure lap times, heart rate, or distance traveled. And though the latest crop of smartwatches is decidedly more powerful, they don’t do much more yet—they’re basically a wearable second screen and remote control for your phone. But there’s nothing wrong with that. There appears to be plenty of demand for such a product. Pebble was the highest funded Kickstarter ever, raking in over $10 million, or 100 times their $100,000 goal. The startup sold 85,000 watches through its Kickstarter, took in 190,000 preorders, and sold out during its Best Buy debut. Central to Pebble’s allure is its price tag. The watch retails for $150—about what you’d expect to pay for a high-end fitness watch. Pebble is compatible with both iOS and Android, connecting to a smartphone by bluetooth to notify wearers of texts, phone calls, and emails. Pebble tells the time and performs a few fitness functions, not unlike a host of older offerings. The watch allows users to download custom watch faces and replace the strap. Perhaps best of all, Pebble has an e-paper display and 7+ days of battery life. 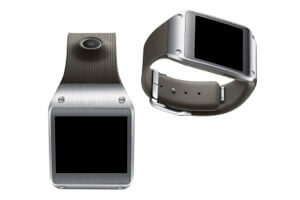 The Samsung Galaxy Gear is twice the price and gets a seventh the battery life, but it offers a color touchscreen, camera, two microphones, a speaker, accelerometer, gyro, and 4GB of memory. While Pebble works with iOS and Android, the Gear is only compatible with Samsung’s Galaxy line of mobile devices. Amid less-than-stellar reviews, it’s rumored Samsung is preparing a refined version for the beginning of 2014. Other offerings include Sony’s SmartWatch 2, Qualcomm’s Toq, and a host of other smaller-brand smartwatches on the market—a dozen were on display at electronics show CES 2013. None really dominate. None are so beautifully designed you want it on your wrist. It’s a genre in development, and app developers may play as much a role as hardware developers in defining the best uses. Apple remains conspicuously absent, despite rumors they’re employing some 100 designers on a smartwatch project. Earlier this year, the firm filed an intriguing patent describing a device made of a continuous, flexible screen attached to the wrist like a slap bracelet. But the firm’s standard veil of secrecy seems to be holding fast. Perhaps Apple is watching and learning from the competition while they hone their own design. It’s easy to doubt the smartwatch genre after recent underwhelming offerings. But really, we’re just awaiting the right execution of the tech. Some labeled the iPad another tablet doomed to fail—before Apple sold millions and induced a mad scramble of emulators. And from a broader perspective, smartwatches (or even smartglasses) may not define wearables. Perhaps instead, they’ll combine with a host of other wearable devices, working in concert and still orchestrated by the smartphone in your pocket. Indeed, market research firm, Gartner, predicts a $10 billion market in wearable electronics by 2016. But the forecast highlights tattoos, shoes, and accessories, noting the added value will be first and foremost in “quantified self” with the measurement of medical and health data or delivery of medicine. Smartwatches may be the first wearable devices to come to market—but they’re unlikely to be the last.